This is a caramel treat with a grown-up twist. 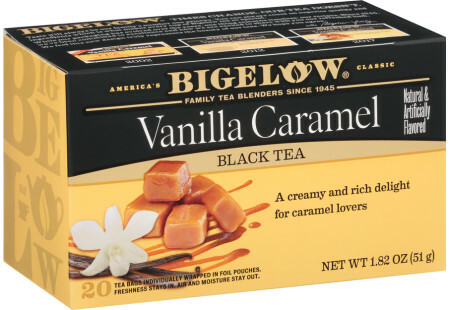 Bigelow's Vanilla Caramel Tea enhances the flavor in this tart. For the Vanilla-Caramel Cream: Bring evaporated milk and 5 bags of Vanilla-Caramel tea to a simmer. Let infuse for 30 minutes. Discard tea bags. Refrigerate milk until cold. Prepare vanilla pudding mix according to the directions on the package for a pie. Use the infused milk. Chill in the refrigerator for an hour or until set. For the Whipped Cream: Bring heavy cream and 2 bags of Vanilla-Caramel tea to a simmer. Let infuse for 15 minutes. Discard tea bags. Refrigerate the cream for at least 30 minutes. Whip the cream and vanilla until soft to medium peaks form. Fold mixture into the Vanilla-Caramel Cream. If desired, reserve a small amount of the whipped cream for garnish. Tart assembly: Spoon the Vanilla-Caramel Cream into graham cookie crust. Spread evenly. Decorate with sliced strawberries.